While I am posting these patterns I realized the in today’s society the art of embroidery is lost on the younger generation. Now to continue with Mrs Beeton’s art of Needlework. Materials: Net, fine muslin; Messrs. Walter Evans and Co.'s embroidery cotton No. 16. The pattern must be traced on the muslin, which should be tacked on the net. The outline of the design must be traced with very small stitches, and worked in overcast stitches, as are also the veinings; the dots are worked in raised satin stitch; the border is embroidered with satin stitch flowers and scallop button-hole stitch. To work appliqué on net, see No. 117 of Embroidery Instructions. 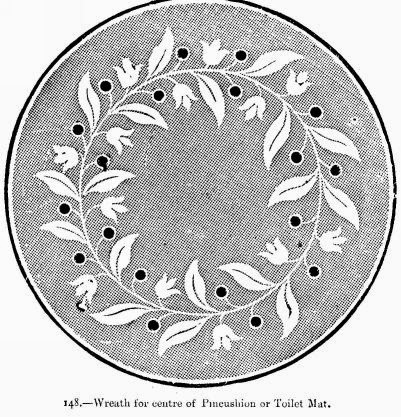 148.--Wreath for centre of Pincushion or Toilet Mat. Materials for Pincushion: Jaconet muslin; Messrs. Walter Evans and Co.'s embroidery cotton No. 16. For toilet mat: White piqué; cotton No. 12. 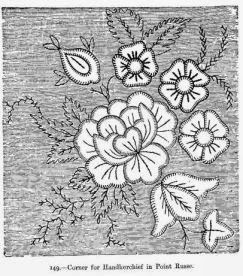 The leaves and flowers are worked in satin stitch; the eyelet-holes and stems in overcast stitch. 149.--Corner for Handkerchief In Point Russe. Materials: French cambric, fine China black sewing-silk, or filoselle. Point Russe stitch is made by a succession of back stitches. These stitches carefully follow every line of the design, and are worked in black China sewing-silk or filoselle. The pattern should be repeated at each corner of the handkerchief. 150 to 152.--Borders and Insertions.--White Embroidery. Materials: Lawn; Messrs. Walter Evans and Co.'s embroidery cotton No. 30, and Mecklenburg thread No. 50; fine black sewing-silk. For the border No. 150, trace first the outlines of the scallop, then draw the threads which are to form the wheel in each scallop (take for this fine Mecklenburg thread, for the rest embroidery cotton), fasten them at the places where they cross each other, and work at these places small and large spots in satin stitch. Then work the scallops in button-hole stitch; edge each larger spot with button-hole stitch all round, and make a row of button-hole stitches for the upper edge of the border, and above this a row of herring-bone stitches. The material is cut away underneath the wheels. The corner borders, illustrations 151 and 152, are worked in point Russe, chain and satin stitch, with fine black sewing silk. Materials: Muslin; Messrs. Walter Evans and Co.'s embroidery cotton No. 50; No. 40 for the edges. 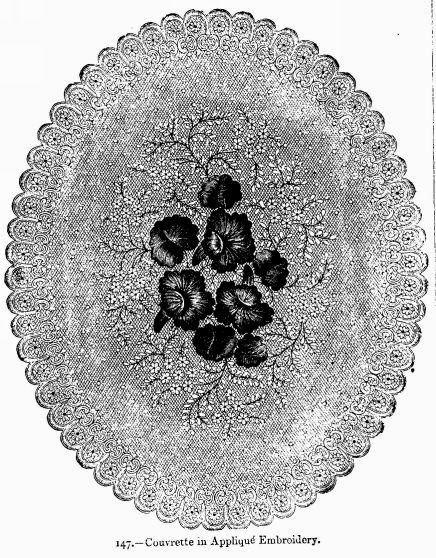 This cravat is worked on fine muslin, embroidered upon both ends in raised satin stitch; the scalloped edge is worked in button-hole stitch; the bouquet in the centre is worked in appliqué satin stitch--that is, the leaves of the rose and the foliage are worked separately on muslin; they are then cut out and worked in appliqué (see Nos. 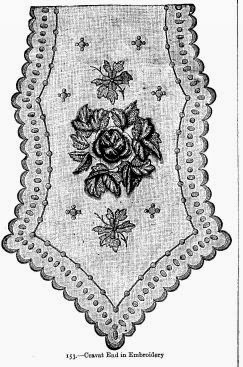 113 and 116, Embroidery Instructions) upon the cravat, as seen in the illustration.